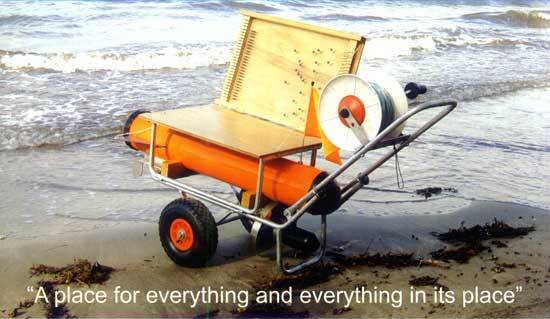 The ultimate electric fishing machine on a beach cart for those without four wheel drive vehicles. The trace holder doubles as a bait board and lifts off the beach cart to become a free standing fish filleting table. It is also useful for cutting baits. Simply flip the lid open to access the traces. This cart unit easily and quickly folds down and will fit into the boot of any medium sized car, hatchback or 4x4. The cart has a place for everything and the handle is easily removed for storage. The result is a compact unit which is easily towed over the beach. The low center of gravity give stability in soft sand.